The investment from Volkswagen in South Africa, mainly at their plant in Uitenhage, has topped out at R6,1 billion . A delegation of Govt representatives, senior management from VW and the media were treated to a break down of this spend, and finally a tour of the plant that manufacturers the ever popular Polo. The 2nd biggest selling passenger car since its launch in 2010, and now in its sixth generation, it has sold close to 200 000 units. The Global figure for this is a whopping 14 million units. 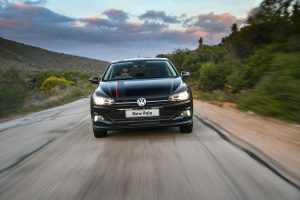 So enter the sixth Generation Polo, and it promises to be bigger, more dynamic looking and with more efficient engines. 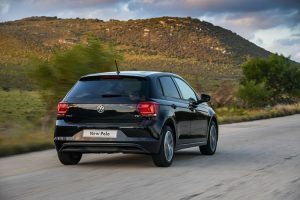 The Polo has a more sporty look about it, based on the (MQB) design used by a host of its bigger siblings, the Polo is longer, wider, has a stiffer body base for better crash protection, more room for passenger exit as well. The look of the Polo is more masculine if that’s what you want, it has a longer roof line that goes into a small rear spoiler.The crease lines below the windows and doors lend itself to the look being more sculpted & athletic. In the front the new headlights ,available with LED technology, as well as the new grille, give the Polo a new face. The rear trapezoidal tail lights, give it more width with the rear diffuser as well. Into the cabin we go, and again space is a bonus here as well. Very driver focused dashboard is apparent, With the Active info display interacting with the infotainment sytem, it puts everything at your disposal for better control, with buttons on hand, and not far away as is sometimes the case. 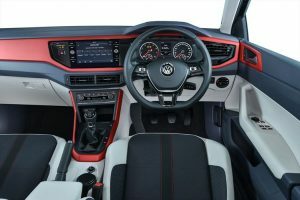 The new Active Info Display and the infotainment systems, give the Polo a more balanced cockpit look. Space is at a premium front and rear, and boot size is increased as well for that extra luggage. The Polo Beats 300-watt sound system lends itself to the younger set in that variant. 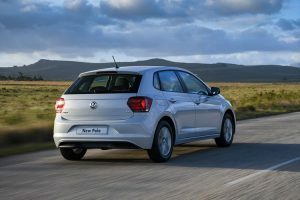 The new Polo comes in 10 exterior colours; Pure White, Flash Red, Dark Petrol, Reflex Silver Metallic, Limestone Grey Metallic, Pale Copper, Reef Blue, Energetic Orange, Deep Black Pearl Effect and White Silver Metallic. The engines in the new Polo are the diminutive but powerful turbo charged 1.0 L 70kw and the 85 kw 1.0 TSI which puts out 200nm of torque. The less powerful engine , interestingly reaches 187 km/h which is what the 1st GTI achieved. They are mated with a 5-speed manual gearbox or an optional 7-speed DSG auto gearbox, which in my opinion was abit out of sync, and needed to lose two gears. Fuel consumption for both are a claimed – 4.5 l/100 km (corresponding to 103 g/km CO2). The 7-speed DSG has a fuel consumption of 4.7 l/100 km and emits 107 g/km of CO2. The new drive systems that are available are comprehensive. Coming with Keyless entry for ease of use it has Blind Spot Monitor to protect from a serious accident, a small light lights up when being approached at the side and if a driver indicates , a louder warning sounds. Rear traffic alert warns the driver of close traffic when reversing out of driveways etc. Multi collision braking helps when you get too close to a vehicle and the car senses you are not aware, it will break for you. Park assist helps to warn you when you get too close when parking to a car or obstacle. And tyre pressure loss indicator will advise when your pressure is not optimal. The drive of the Polo is smooth and responsive, it is comfortable, and spacious indeed. The engines all beit the 1.0 L which many people might not like, are enough to power this car effortlessly. It comes with a great deal of features which some are optional. Trendline. The Trendline base version is very well equipped. Standard features include assistance systems such as the Automatic Post-Collision Braking System as well as LED daytime running lights and front and rear curtain airbags. Front Electric Windows, Composition Colour infotainment system with four speakers and a Connectivity Package featuring Bluetooth and USB also come as standard. Multi-function Display “Plus”, the Composition Colour infotainment system with six speakers, leather multi-function steering wheel, Driver Alert System and front and rear electric windows. App Connect, Voice Control, Sport seats, Cruise Control with speed limiter and white LED ambient lighting (front doors and instrument panel). beats. The new edition of the successful Polo beats special model has a 300-watt sound system from legendary US audio specialist ‘beats’ (by Dr. Dre) and a whole array of customised features on board. The newly-designed amplifier and subwoofer are housed at the bottom of the boot to the left hand side of the spare wheel well, where a full-size spare wheel is housed. The Comfortline and Highline trim versions can be further personalised by choosing the R-Line package. R-Line. The ‘R-Line’ package makes the Polo even more dynamic with such features as 17-inch alloy wheels (‘Bonneville’), a large, sporty front bumper and, at the rear, a diffuser with chrome trims and a roof spoiler. 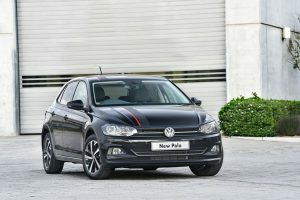 The Polo with R-Line package also has wrap-around black sill trim strips which visually press the car down to the road. The R-Line Package is only available in South Africa from the beginning of the second quarter. 3 year/120 000km warranty and a 12 year anti-corrosion warranty. Service Interval is 15 000km.